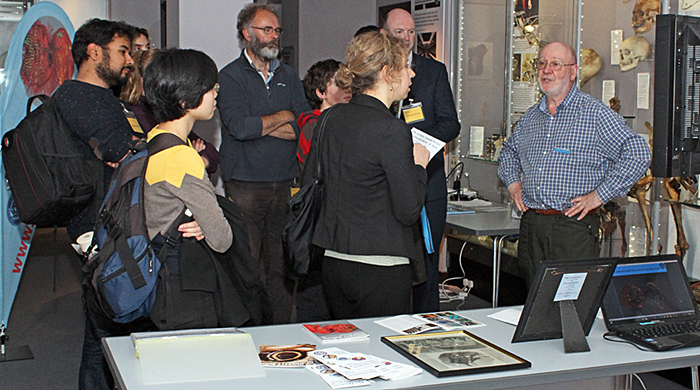 This special Museums at Night event for families was organised by the Royal College of Surgeons in collaboration with the Club to commemorate both the bicentenary of the birth of the Victorian microscopist John Thomas Quekett and the 150th anniversary of the founding of the Quekett Microscopical Club. Over 100 visiting adults, children and students were able to make their own slides, to discover the sometimes surprising structures of everyday things seen up close, to see original Victorian ‘Wow’ slides, to view original archive materials, to discover the role that microscopes have played in surgery, and to recreate the beautiful designs and delicate patterns of traditional mounted slides in a drop-in art session. 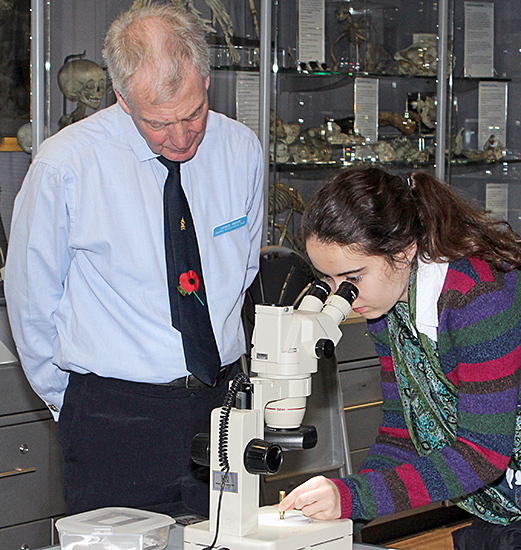 The exhibits and demonstrations were set up in the Hunterian Museum, mostly in the MacRae Gallery. 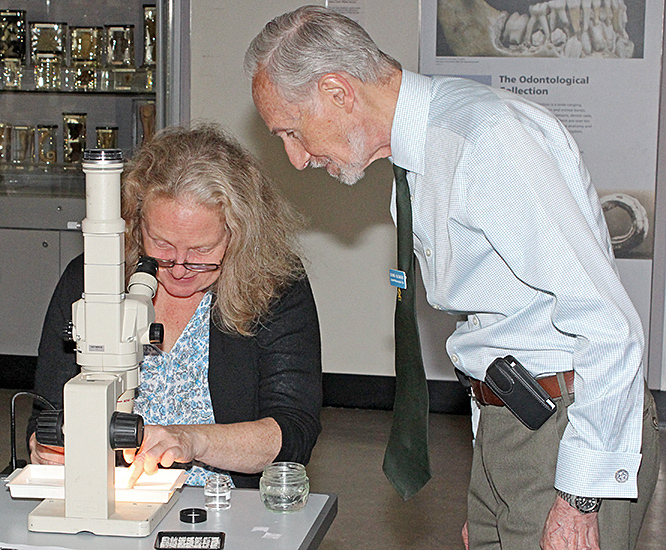 David Linstead, assisted by Jacky McPherson, showed a rolling presentation of Victorian microscope slides from his collection on a television, including legs of fleas and water beetles, tongue and brain sections, and fish skin. 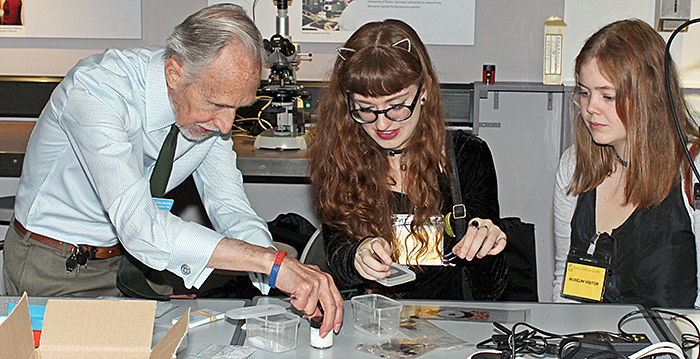 David also used an antique brass Watson microscope from the Club’s collection (with illumination via a bulls-eye lens) to show some actual Victorian microscope slides, including Dover sole skin and some seeds. The brass Watson microscope was quite an advanced model, the sort that a well-to-do Victorian gentleman would have used to show off his latest slides to his fellow enthusiasts after dinner. 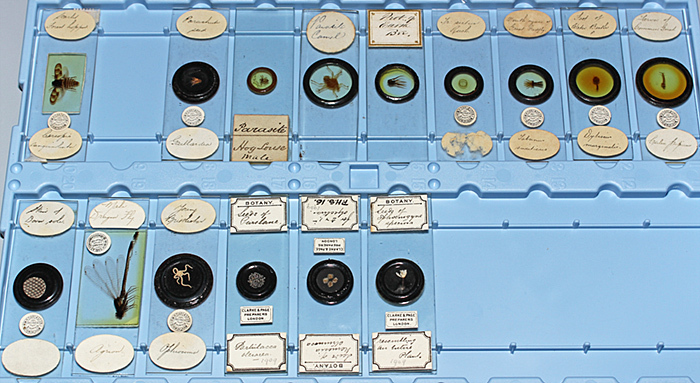 Production of microscope slides was a significant cottage industry, with mounters selling direct to collectors as well as to microscope manufacturers. Firms also imported prepared slides from continental Europe. 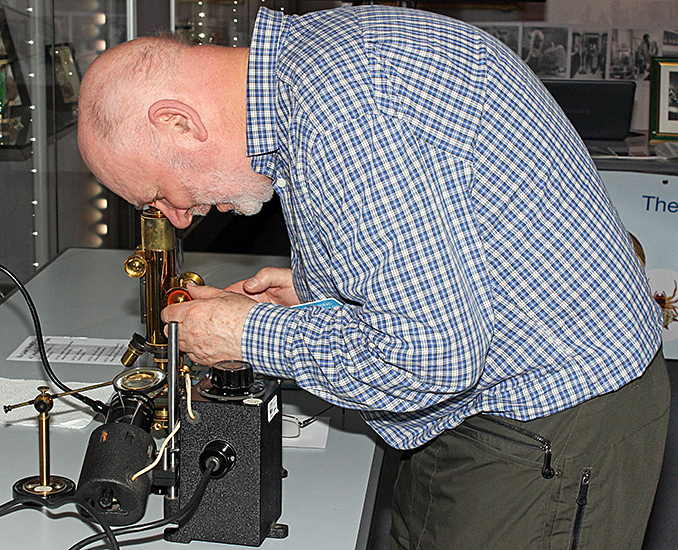 Dennis Fullwood is another enthusiastic and knowledgeable collector of slides, and brought along several wooden boxes containing Victorian slides from his collection for viewing under his Nikon Labophot compound microscope. 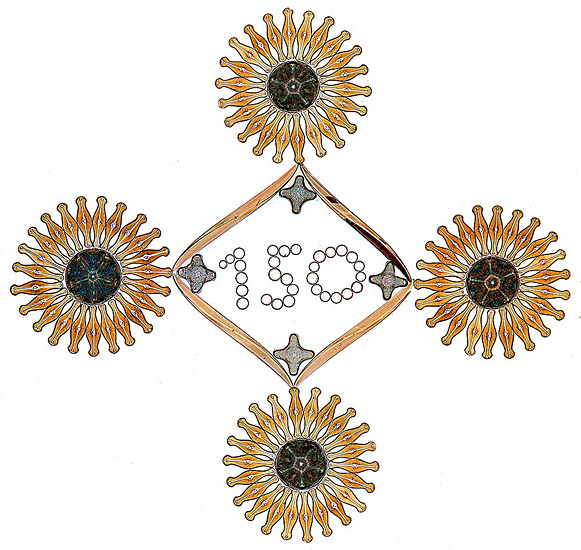 In addition to Victorian slides, including a human louse showing its claws for holding on tight, Dennis showed the diatom arrangement that he had commissioned from Klaus Kemp to mark the Club’s 150th anniversary, photographed by David Linstead for the Annual Exhibition of Microscopy. 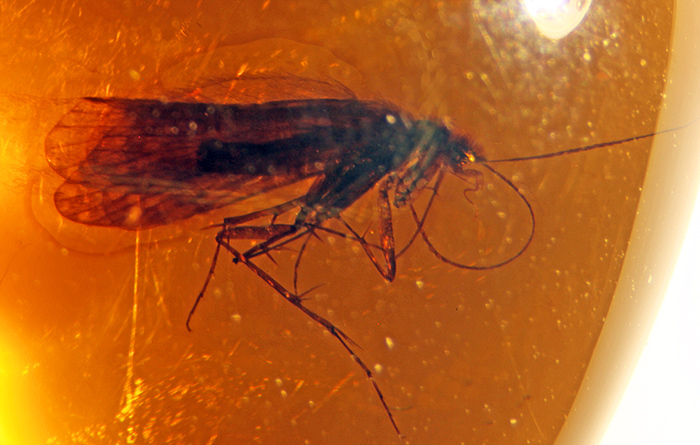 Dennis also collects amber that contains insects and other arthropods, and brought several pieces from his collection for viewing under one of his Olympus SZ4045 stereomicroscopes. 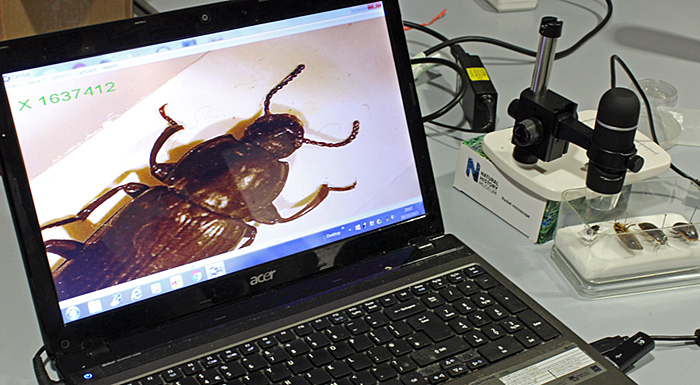 Tim is an amateur entomologist, and brought some present-day insects (a beetle and some cockroaches) for viewing under a stereomicroscope and on a laptop computer with the aid of a USB microscope. 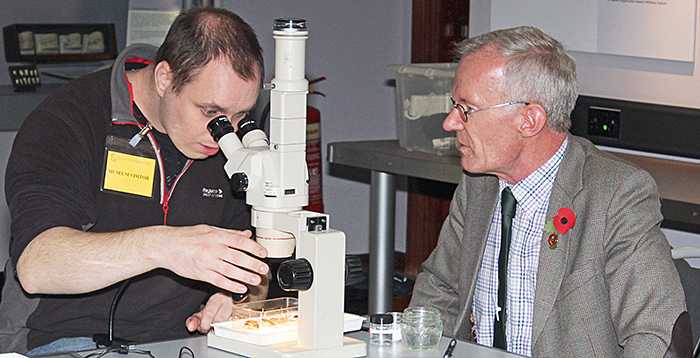 James Rider and Paul Smith were kept busy showing visitors some of the items that Dennis had provided for viewing under his stereomicroscopes, including shell sand, insects in amber and mouldy bread. Dennis also brought 4 spent cartridge cases that had been fired from 3 different guns, and challenged visitors to identify the two from the same gun by examining the impression of the firing pin under a stereomicroscope. 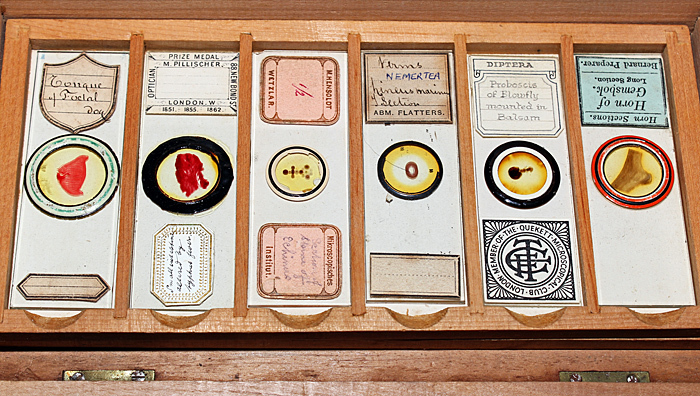 Dennis Fullwood provided materials and specimens for making dry mounts, a type of microscope slide in which the subjects are not mounted in liquid or resin. 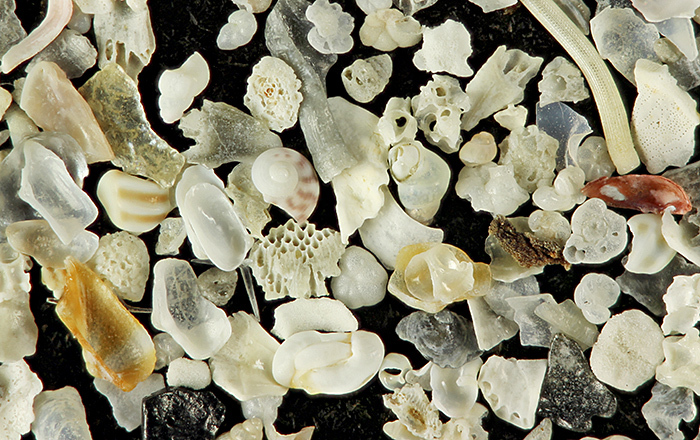 One of the subjects was recent shell sand from Dog’s Bay in Connemara. 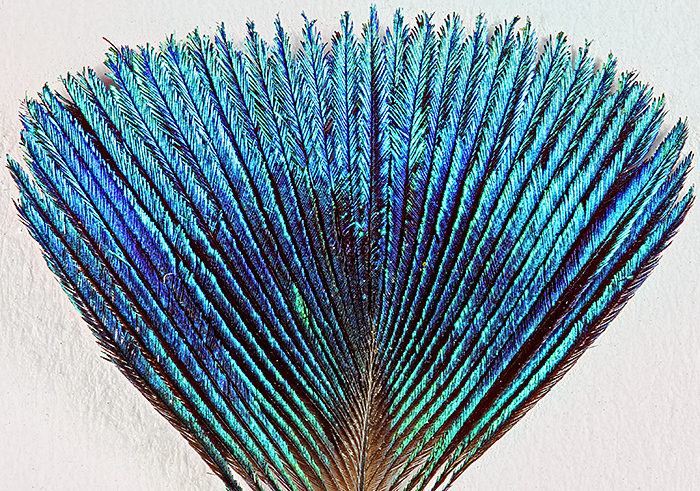 The second subject was small, brightly-coloured feathers from a peacock. 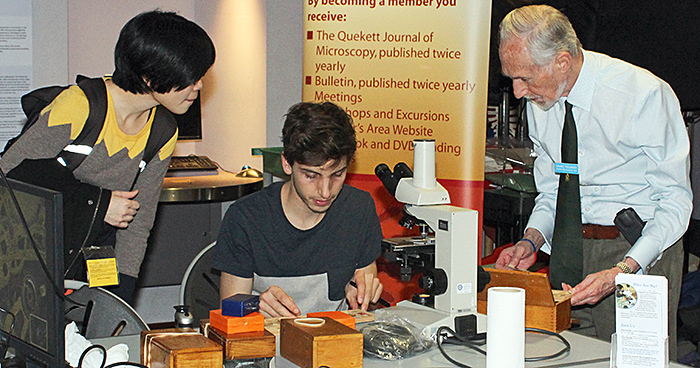 Alan Wood brought along his trinocular Olympus SZ4045 stereomicroscope that he had used earlier in the day at the National Honey Show, and with his Canon EOS 5D Mark II camera he was able to show specimens on a television. 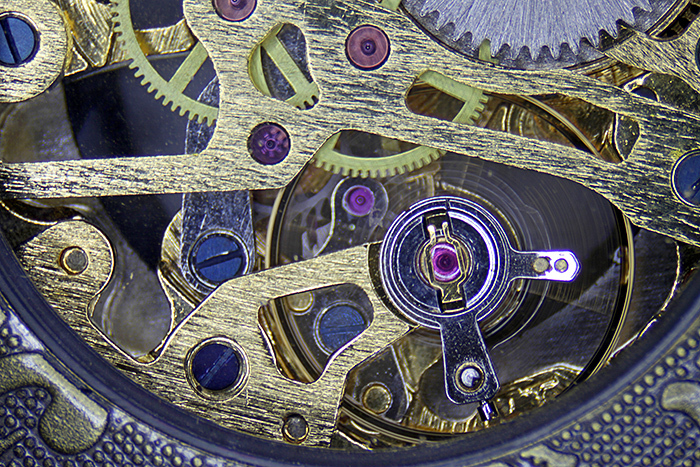 One of the most popular items was a pocket watch with a clear panel that enabled the moving parts to be clearly seen. Other specimens included skin of a Dover sole and a feather from a peacock. Upstairs in the Science of Surgery Galleries, Terry Hope (a real-life neurosurgeon) was dressed as a surgeon to explain Victorian surgery, the development of antiseptics and the use of microscopes in surgery to visitors. 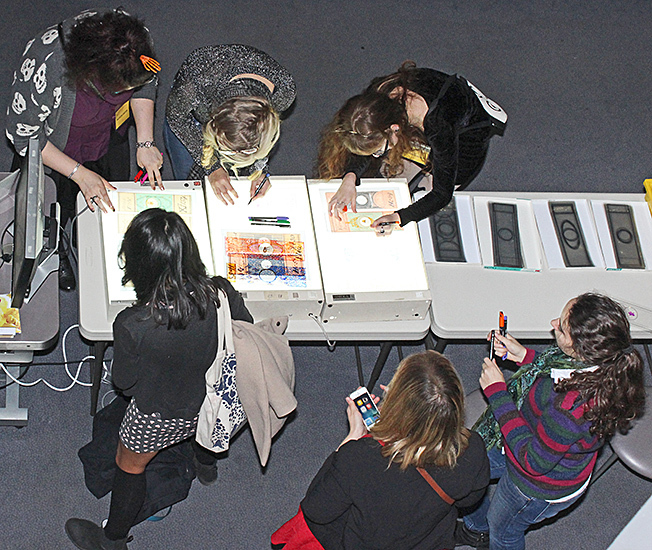 In the Crystal Gallery, visitors could try their hand at creating large versions of Victorian-style slides using acetate film and coloured pens, working on light boxes. In the Library Reading Room, Emmy Bocaege showed visitors microscope slides from the College’s collection that had been prepared or acquired by John Quekett, some of his notebooks, and drawings by Robert Hooke. 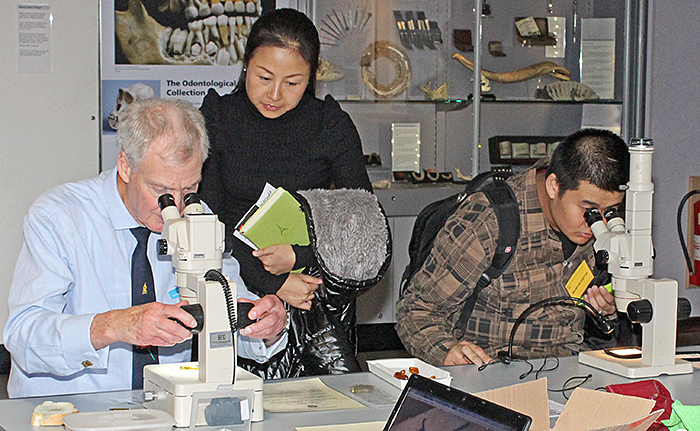 Our thanks to the Royal College of Surgeons for organising this event and enabling us to reach a wider audience than usual, and for allowing us to take photographs in the Hunterian Museum.